OFF! Deep Woods® Insect Repellent V (Tick) provides long-lasting protection against ticks (including the ticks that may cause Lyme Disease), mosquitoes and biting flies, stable flies, black flies and sandflies. Also repels chiggers, fleas, gnats, no-see-ums so you can enjoy the outdoors uninterrupted. 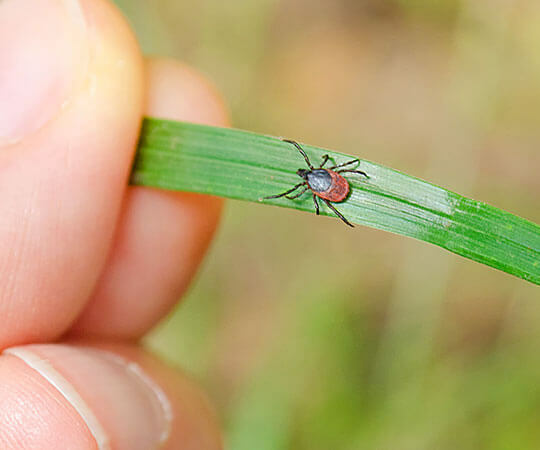 Long-lasting protection from ticks (including the ticks that may cause Lyme Diease). Long-lasting protection from mosquitoes, biting flies, gnats, and chiggers. Formulated with 25% DEET—provides up to 8 hours of protection against mosquitoes. Read and follow all directions and precautions on this product label. Hold container 6 to 8 inches from skin or clothing and spray with a slow sweeping motion. Do not apply over cuts, wounds, irritated or sunburned skin. Do not spray in enclosed areas. Use just enough repellent to cover exposed skin and/or clothing. Avoid over-application of this product. Frequent reapplication and saturation are unnecessary. Do not allow children to handle this product. Do not apply to children’s hands. When using on children, apply to your own hands and then put it on the child. After returning indoors, wash treated skin with soap and water. Spread evenly with hands to moisten all exposed skin. Do not puncture or incinerate! If empty: This container may be recycled in the few but growing number of communities where aerosol can recycling is available. Before offering for recycling, empty the container by using the product according to the label. If recycling is not available, place in trash. If partially filled: Call your local solid waste agency or 800-529-3394 for disposal instructions. CAUTION: Causes moderate eye irritation. Avoid contact with eyes. Harmful if swallowed. Use of this product may cause skin reactions in rare cases. Wash treated clothing before wearing it again. Wash hands thoroughly with soap and water after handling and before eating, drinking, chewing gum, using tobacco or using the toilet. • If in eyes: Hold eye open and rinse slowly and gently with water for 15-20 minutes. Remove contact lenses, if present, after the first 5 minutes, then continue rinsing eye. Call a poison control center or doctor for treatment advice. • If swallowed: Call a poison control center or doctor immediately for treatment advice. Have person sip a glass of water if able to swallow. Do not induce vomiting unless told to do so by a poison control center or doctor. • If you suspect a reaction to this product, discontinue use, wash treated skin, and call your local poison control center.